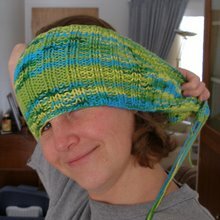 Early this spring I discovered a gardening technique that I had never heard of before. I'm sure most of you know about grafting with trees, but did you know you could do it with vegetables too? 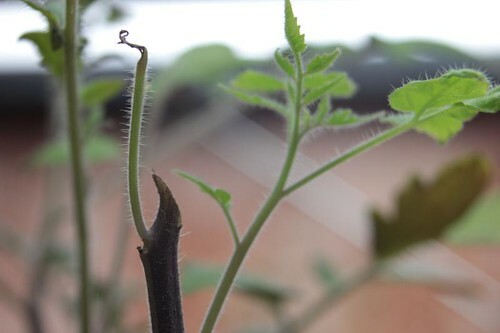 Tomato grafting allows you to combine the best characteristics of two types of plants into one. I read about it over at A Way to Garden and I totally geeked out. Two parts of my personality, the avid gardener and the nerdy biologist, were jumping up and down inside my head. Most gardeners are well aware of the tomato blight, viruses that are destroying tomatoes around the country. And it's also true that heirloom tomatoes, the best tasting kind, in my opinion, are particularly susceptible. Really, that's one of the reasons why they started breeding hybrids, to make them more resistant to these viruses. The problem is that hybrids don't taste as good as the heirlooms. 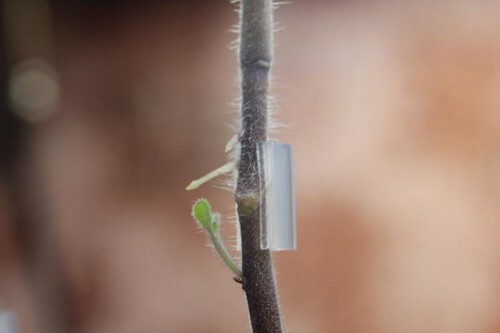 Armed with a razor blade and a silicone clip, you can take two seedlings and combine them into one super tomato plant via razor blade surgery. One seedling should be disease-resistant and prolific. This becomes the rootstock (the bottom half) and controls overall how the plant grows. The other seedling should produce fruit that taste really yummy. This becomes the scion (the top half) and controls what the fruit look and tastes like. It really is just about that simple. In theory. 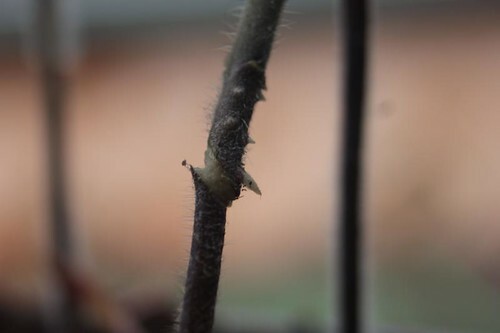 I especially like this picture (above) because it shows how the rootstock on the bottom is attempting to grow itself some leaves while the scion on the top is attempting to grow its own set of roots. All of these will need to be pulled off to keep that from happening. If these were allowed to grow, it would ruin all the hard work, producing grodey hybrid fruit and reducing the disease resistance of the plant. I actually managed to create 6 successfully grafted plants on the first go. I felt a bit like a mad scientist during this entire endeavor and may or may not have had the words, "It's Alive!" go through my mind every so often. The silicone clip fell off of this guy (below) early on, but the two parts somehow managed to stay close enough together to fuse. 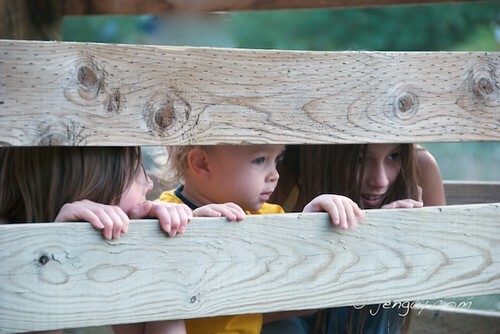 It's definitely less pretty than the others that were held closer together, but I still think it's amazing. I won't go into the specifics right now as I am miles away from being any sort of authority on the subject. Though I do promise to include more info as I figure it out. I basically followed the instructions in this video for the top grafting, not the side grafting that he starts out explaining. Oh, I almost forgot. 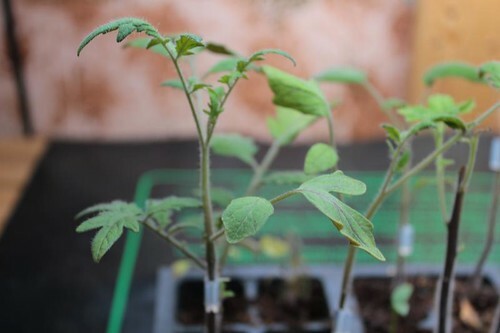 I have seen grafted tomato plants for sale at a nursery or two around town. They were running about $12 for a gallon size. So depending on how many you want to grow, this might be a more economical solution for you.